After the emergence of programs for the creation of fifth-generation fighters and bombers, the Russian aircraft manufacturing industry has started designing an aircraft of the future, capable of performing tasks that modern transport aviation is not quite up to. A whole family of military transport aircraft, ranging from medium to heavy, is to be designed as part of the Prospective Airborne Complex of Transport Aviation (PAK TA) project, a military source has told the Russian online publication Lenta.ru. Some of the aircraft will be specifically designed to carry tanks and Armata-mounted armored vehicles. According to Russian media reports, the Armata universal combat platform may be displayed during the Victory Day parade in Moscow on May 9 this year. The majority of aircraft used in Russian military transport aviation were designed back in Soviet times. Since their upgrade makes it possible to just slightly extend the service life of the aircraft, defense industry companies insist that new transport aircraft be developed. In 2014, a tender to develop a new heavy aircraft was won by the Ilyushin design bureau, famous for its Ilyushin Il-76 cargo aircraft (40-50 tons). Sergei Sergeyev, Ilyushin’s general director, said that in 2016 the company will start designing an aircraft with a cargo capacity of over 80 tons, under the name of Yermak. Yet, by 2015, despite the involvement of the Central Aerohydrodynamic Institute (TsAGI) and the Myasishchev Experimental Design Bureau, the terms of reference for the project have still not been drawn up. According to the Strategy and Technology Analysis Center blog, “the heavy long-range military transport aircraft of military transport aviation” represents yet another attempt to revive and further develop the Ilyushin Il-106 project. In other words, the Yermak project, originally conceived as a cargo aircraft with a capacity of 80 tons, may be replaced with another promising project, on whose basis future medium and heavy aircraft, capable of transporting cargoes from 50 to 150 tons and more, will be created. The unification of assembly units and systems of the new aircraft will make it possible to cut costs in the production of the PAK TA, and state participation in the project will ensure that the new transport aircraft enters into service without delay. A launch date of Jan. 1, 2024 has been mentioned. “That aircraft is capable of transporting cargoes of 80 tons at a cruising speed of 770-850 kph to a distance of up to 5,000 km. In other words, it is an aircraft with medium cargo capacity,” said Shvarev. “For reference, the Ukrainian Antonov An-225 Mriya cargo aircraft is capable of carrying 220 tons, or four T-72 tanks. 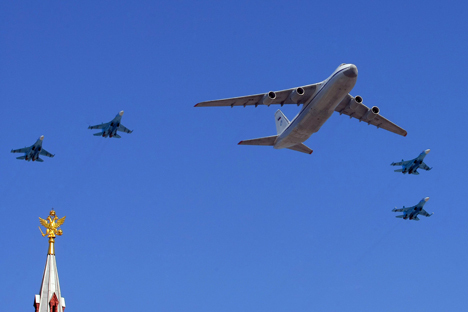 However, the Il-76 is capable of carrying only one T-72 tank, while to transport a T-90 tank, some of its assembly units will have to be removed,” he said. “Given that the T-14 Armata tank will weigh at least 60 tons when fitted with a full dynamic protection system, transporting 1.5 tanks by medium military transport aircraft and two tanks on a heavy one is not economically viable. Yet a project for an aircraft with ultra-large cargo capacity is not on the cards, it is a matter for a very distant future,” said Shvarev. However, if the PAK FA program is implemented, the development of these aircraft will allow the Russian Armed Forces to potentially move large numbers of armored vehicles by air rapidly to any place in the world. Given Russia’s vast territory, future transport aircraft will improve the mobility of the country’s armed forces, something which cannot be achieved by railroad and road transport alone.